Industrial Magnetics, Inc. introduces a revolutionary new magnet called the "Transporter". The Transporter magnet uses an air cylinder to raise and lower it’s Powerful Rare-Earth magnet to attract and release parts between presses or any automated parts handling operation. 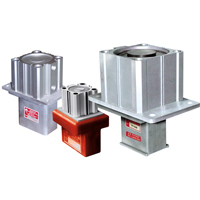 The new Transporter magnet offers faster pickup and release than most vacuum cups and has a much longer life due to the durability of the permanent magnets. IMI’s Transporter can also be used instead of expensive and hard to adjust grippers. Increase Production and Reduce Operating Costs!